It is best and safest to work with a single herb if you are new to this. In the first 2 Photos we have the Filtered Tincture. 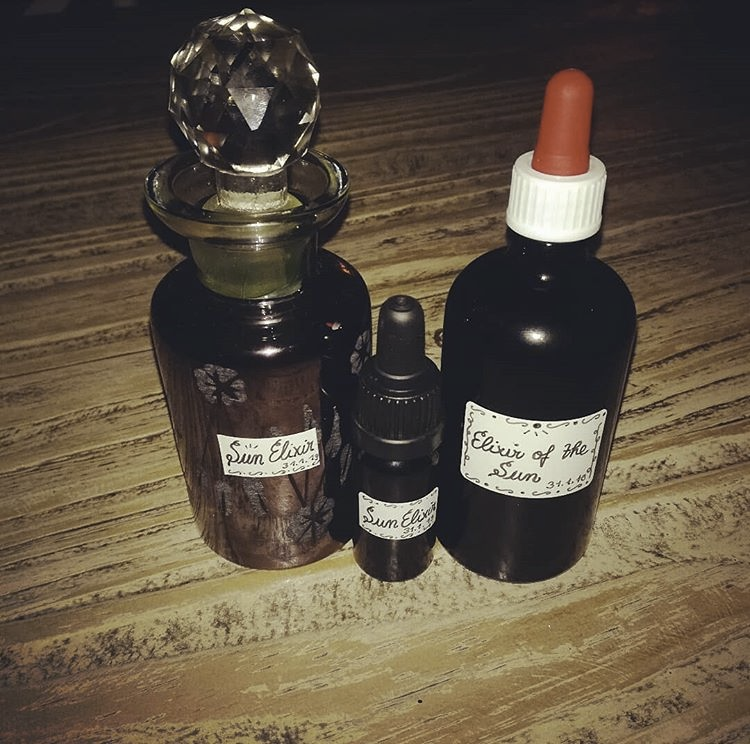 I added one photo without flash in which you see the dark green tint of the tincture, and the other is one made with flash which took me by surprise since it revealed the tincture as blood red. As if it managed to capture the intensity of the soul of the plant. 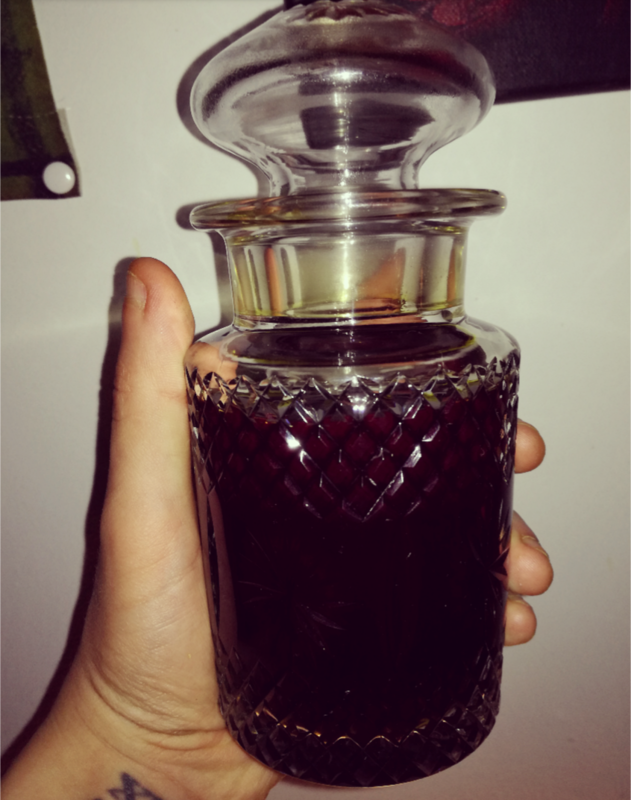 Tincture, photo taken with Flash, makes it appear blood red. In fact it is dark green. The Ash Solution is filtered and boiled down slightly. Now before adding your salts to your tincture it is important that your tincture is highly concentrated in Sulphur(Oils) otherwise your salts will not react and just drop to the bottom of your tincture completely inert. If your plant or herb is high in essential oil content, then a strong tincture will generally accept the salts and react with them. If the herb is less rich in essential oils, you can do a further step to concentrate your tincture by evaporating off some of the alcohol until you have a really concentrated tincture remaining. In which you add the salts and they will react. You will know they are reacting since you will see at the very least fizzing and bubbles forming, color changes can happen, etc. It is possible that you have more salts than your tincture can take, in which case it is normal if a little bit drops down to the bottom of the glass. After adding the salts and once the reaction is over, simply filter the elixir once again through a coffee filter, to remove any insoluble leftovers/salt and bottle it up in a dark glass container/bottle. A safe dosage for spiritual/subtle effects according to the alchemical art would be 1-5 drops of elixir diluted in a drink of your choice. You can work with higher doses for medicinal effect, but will have to inform yourself about the safe amounts you can take depending on the herb you are working with. This is not an entirely alchemical process in the truest sense, but it serves as an intro into the art of spagyrics and some of its concepts. These very same processes are all parts of the alchemical process but become more refined and complex in the different operations one can do. I hope you enjoyed this small Tutorial, and if you have any question then please don’t hesitate to ask. You can leave a comment on this article or you can contact me on FB through our Catharsiopa Page, just send a private message there. 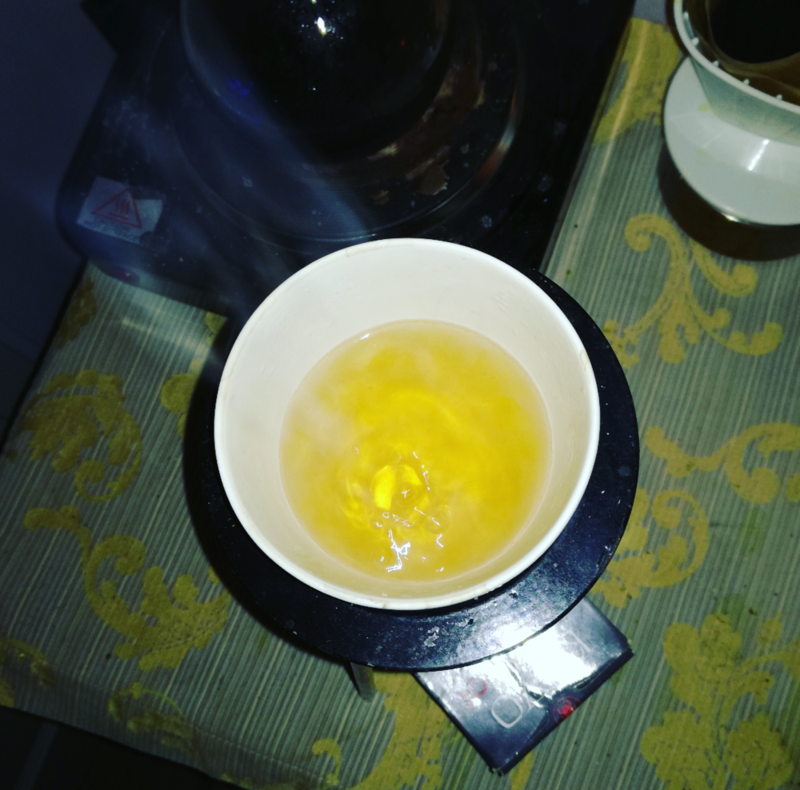 If you are interested in checking out the Planetary Correspondences for Herbs you can go to this Link, which has quite a large list just click on one of the planets and voila, but I would advise you to check different references as well. (Tincture, Original Color) So concentrated it is hard to recognize, at the bottom of the vial you can see it is dark green/yellow. We simply put the dried plant matter in a mason jar with 96% Grain Alcohol and leave it to macerate for a period of 2 weeks. Then we pour it through a coffee filter into a new glass, like I did into the vials depicted above and store for later. We take our separated plant matter and proceed with calcination. We take our leftover plant material and put it into a fireproof container, here I used a copper pan, a ceramic crucible would be more ideal though. We burn our plant matter to a fine grey/white ash. by doing this we are releasing the salts from their carbon cage, freeing them from the cellular matrix of the plant, allowing us to collect them from the ashes with distilled water. Once we have our ashes we must now proceed with leaching them with distilled water to extract the water-soluble salts from the ashes. To do this we take our ashes and put it into a glass container or chemically resistant pot. (Our salts are highly alkaline and corrosive) We add distilled water to them and finally we bring it to a slight boil, this will help the salts better dissolve into the water. Now we take the boiled ash solution and pour it through a filter (I generally use 2 coffee Filters, to make sure no fine ash particulates make it through.) This will leave us with a clear liquid of varying color, depending on the plants you used and the mineral composition of the plants color can vary. 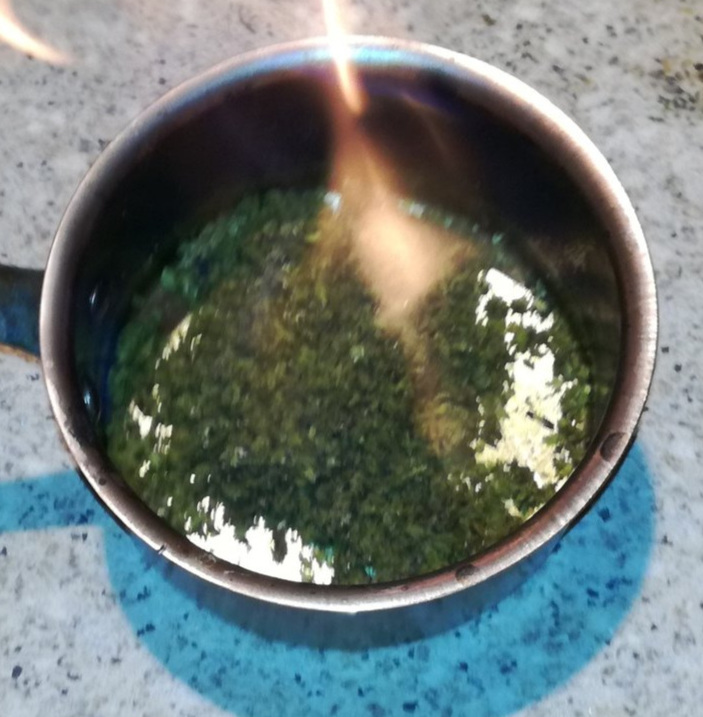 We can boil this solution down slightly before adding it to a glass oven-safe dish, which we put into the oven at 120°C to evaporate the water off to obtain our pure salts. I use a razor to scrape the salts off of the glass dish once all the water has evaporated. If everything was done correctly we should end up with a fair amount of highly alkaline plant mineral salts crystallizing. You can see them depicted here as almost entirely white salt crystals scraped together into a small glass vial, ready to be introduced to our tincture. Concentrating our tincture by boiling off some of the alcohol. Preparing it for the salts. This was my Final Product. A successful marriage between Salt and Sulphur united in Mercury. ← Teaching Medicine: Organic Herbs have Arrived.